This is a high quality, ARP Head Stud kit for the Audi 2.7T engine. ARP has just released this Pro Series fastener kit. These head studs are manufactured from premium grade ARP2000 material that is rated at 220,000 psi tensile strength. This kit includes premium grade 8740 chrome moly 12-point or tri-square nuts, 8740 chrome moly washers, and 1/2 ounce pack of ARP Ultra Torque fastener assembly lubricant. ARP fasteners are centerless ground, heat treated prior to thread rolling and machning and designed to exceed the OEM fasteners in strength and durability. This Head Stud Kit will ensure your head does not lift, even when subjected to extreme cylinder pressures on high boost applications. These ARP fasteners are completely reusable, making them a perfect match for race engines. Manufactured from the high strength ARP 2000 alloy. - Thoroughly clean the M11x1.5 threads in the block and chase them if necessary. - Ensure that block and head surfaces are completely clean and flat. - Lubricate the studs lightly and screw them in until they bottom out in the block. Do not force them any further! 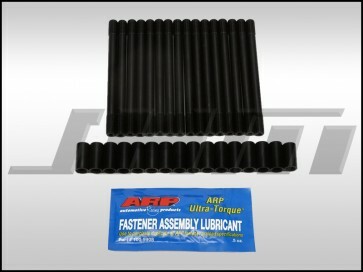 - Install the provided nuts using the provided ARP Ultra-Torque Fastener Assembly Lubricant. - Torque the nuts using the factory pattern to 30 ft.-lbs. - Torque the nuts again using the factory pattern to 60 ft.-lbs. - Torque the nuts one more time using the factory pattern to 95 ft.-lbs.